This content was paid for by Hayward and produced by Swim University (Ace Media, LLC.). We only reach out and work with sponsors we trust and recommend. Last Updated: May 11, 2017 | Subscribe to our weekly newsletter! Although salt water pools have been around since the 1970s, their popularity has grown rapidly in recent years. This is due in large part to their reduced cost in upkeep. They’re also easier on your skin, hair, and eyes, and you’ve probably heard salt water is healthier than chlorine, too. Maybe you’ve been thinking about converting to a salt water pool to take advantage of all those benefits. But what a hassle that change would be, right? Actually, the conversion process is fairly simple, so if you’re thinking of doing it yourself, you’re in luck. Why Convert to a Salt Water Pool? Chlorinated pool water can be hard on you because of chemicals called chloramines. These compounds are created when the chlorine in your pool water comes into contact with things like urine and sweat, and they can be harmful in two ways. First, they aren’t effective at disinfecting the water like chlorine, so water cleaning is inhibited. Second, they cause irritation of the eyes, skin, and lungs. Strong chloramines can build up in the air surrounding a pool, especially indoor pools. When the air is thick with these chemicals, it can even cause coughing or trigger an asthma attack. Frequent exposure to chlorine can even cause some people to develop an allergy or sensitivity to the chemical. And for those who are already sensitive to it, swimming in a chlorine pool can cause rashes, hives, and itchy skin beyond the simple dryness you may experience from chlorine exposure. If you have respiratory problems, such as asthma or allergic rhinitis, you may find your symptoms exacerbated by frequently swimming in a chlorine pool. If your pool is causing you discomfort, switching to salt water could be just the solution you’re searching for. On the less serious side, if you’re a blonde, you’ve probably experienced green hair from swimming in a chlorine pool. Colored hair can look great, but this probably isn’t exactly the look you’re going for. So why does it happen? Science! Just like a lost penny on the beach turns green, copper in your pool water can turn your hair green, and high chlorine levels can just make it worse. Chlorine and copper bond readily, coating your hair in green film. Switching to a salt water pool can lower the likelihood of green-stained hair. If you have this problem, be sure to test your water for heavy metals. One common cause of copper in your pool water is using copper-based algaecide. Check your algaecide, and consider a non-copper alternative If you click this link and make a purchase, we earn a commission at no additional cost to you. .
What’s So Great About Salt Water? So now that you understand why chlorinated water may not be the best option for you and your family, let’s talk about what might make salt water a better choice. Switching away from harsh chlorine has to be a positive, right? Sure. But the most important thing to understand is that salt water pools are not actually chlorine free. However, the presence of salt in the water reduces the kind of eye and skin irritation you may experience by swimming in a chlorine pool. A salt water chlorinator If you click this link and make a purchase, we earn a commission at no additional cost to you. creates the same kind of chlorine used in a chlorine pool. It’s imperative to keep chlorine levels stable to inhibit the formation of chloramines. In a salt water pool, when chlorine levels are stable, and chloramines are not present, the salinity of the water is much closer to the salinity of your natural tear ducts. This is why it doesn’t hurt to open your eyes in a salt water pool, and why your skin and hair won’t feel as dry after swimming. While you may have been led to believe that all you need to do to maintain a salt water pool is throw in some salt every few weeks, it’s actually a bit more involved than that. The good news is, salt water pool maintenance can cost a lot less than caring for a chlorine pool, which can be one of the most important deciding factors in making the switch. Exactly how much less expensive salt water is than chlorine over the lifetime of your pool depends on several factors such as where you live, the size of your pool, the quality of the equipment you use, and how well you maintain it. The up-front cost of a salt water chlorinator ranges from a few hundred to a thousand dollars or more. Long-term costs include replacing the chlorinator cell—the part that actually converts salt to chlorine—every five years or so, provided you maintain your chlorinator well. You’ll also still need to keep your water balanced, but another positive aspect of salt water pools is they usually require fewer chemicals to keep the water balanced. So while things like test strips If you click this link and make a purchase, we earn a commission at no additional cost to you. or digital testers and a few chemicals will still have to be part of your maintenance budget, your monthly chemical costs will still be lower with a salt water pool, than with chlorine. You might be surprised to learn that salt water pools contain far less salt than seawater. The ocean’s salt level is 35,000 parts per million (ppm), roughly ten times more salt than that water in a salt water pool. As a result, the water feels quite soft, and you won’t notice the salt in a salt water pool the same way you do at the beach. It doesn’t even taste salty—but you still shouldn’t drink it. Before you install the chlorinator and begin the conversion process, you’ll need to decide how to best introduce the salt to pool water. The good news is, you don’t have to drain your pool. However (You knew there would be a however, right? 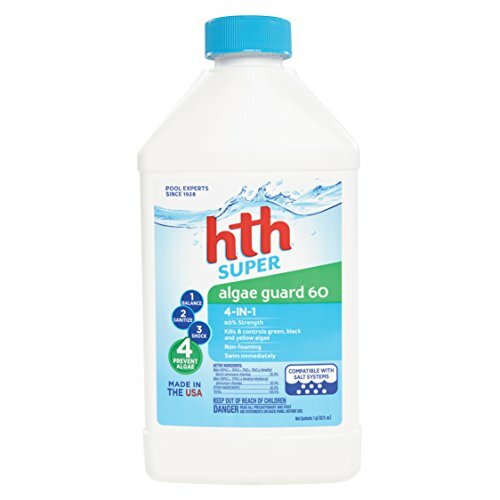 ), if you currently use an antibacterial agent in your pool, draining the pool may be a good idea. The active ingredient in this type of pool sanitizer is polyhexamethylene biguanide, a chemical that is not compatible with chlorine. Because your salt water pool will contain chlorine, if this agent is not first removed from the water, your pool water will not be properly balanced, and the chlorine will be less effective at keeping your water clean. You have two options in this case—drain your pool and start from scratch with new water, or “burn” the antibacterial agent out of the water with a high dose of chlorine. This option will turn your pool water white, and it will take several days to dissipate. Once it does, you can begin the salt water conversion process. 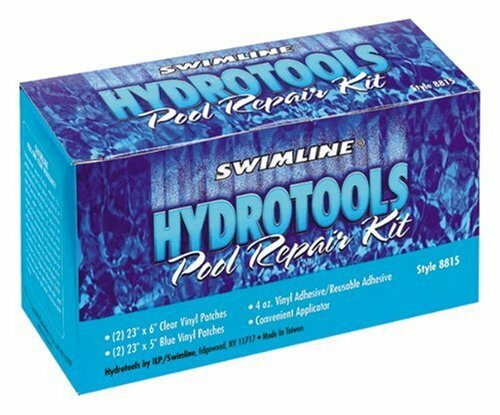 Before you begin altering your pool water chemistry, you first need to test for free chlorine, pH, cyanuric acid ( stabilizer If you click this link and make a purchase, we earn a commission at no additional cost to you. ), alkalinity, calcium hardness, heavy metals, and salt. If you need to make adjustments, do so in this order: chlorine, alkalinity, pH, stabilizer, calcium hardness, then metals. The order matters because each adjustment can affect the other measurements. It’s also important to make the adjustments over time, so take that into account while choosing when to install your chlorinator. After your water is balanced, you’ll be ready to add salt to your pool. If you have a vinyl liner, you’ll be happy to know you can use a salt water chlorinator system in your pool without taking any extra precautions. The liner will be exposed to lower levels of chlorine, so it may even extend your liner’s lifespan. However, many inground pools have galvanized walls behind the liner. If your liner springs a leak If you click this link and make a purchase, we earn a commission at no additional cost to you. —even a small leak—allowing salinized water to seep out against the steel wall, the wall will eventually corrode. Similarly, above ground pools with a lot of metal parts can rust over time due to exposure to salt water. If you have a resin above ground pool, you can make the switch without this concern. A salt water chlorination system works by passing an electrical current through salinized water, causing a chemical reaction via electrolysis that creates chlorine from salt molecules. 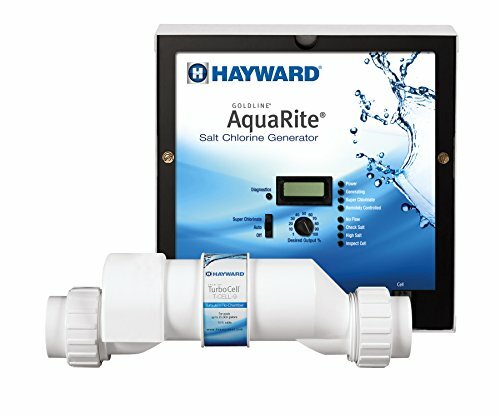 The two main parts of a salt water chlorinator are the cell and the control board: the cell is where electrolysis takes place to create chlorine; the control board allows you to adjust how much chlorine is generated. Size – Choose the size you need based on your pool capacity in gallons. If you’re not sure how many gallons your pool holds, use a volume calculator to figure it out. Price – Buy a chlorinator that is both priced within your budget, but of the best quality you can afford. Chlorinator costs span a range from a few hundred to a thousand dollars. Cheaper doesn’t necessarily mean worse, but don’t forget to consider lifespan and replacement costs in your search. Features – Select a system that offers all the bells and whistles you need according to where you live, and how much automation you want. Basic chlorinators allow you to adjust the amount of chlorine they’ll create and not much else. Fancier systems offer digital readouts, salt levels, automatic cell cleaning, flow control, and freeze protections, among other things. The process of converting an existing chlorine pool to a salt water pool is much simpler than you might imagine. Once you’ve invested in a quality salt water chlorinator, you’re ready to install it, and begin the conversion process. After your water is properly balanced, installing the cell and control board will take about one day. Be sure to shut off the power with the circuit breaker before you begin. Keep it off until you’re ready to test the unit, then shut it off again while you complete the installation. You’ll be working with water and electricity, so proceed with caution. If you’re not confident working with electrical wires, basic hand tools, and cutting and gluing PVC pipes, we recommend letting a pro handle the installation. If you feel you have the skills to tackle it, you can do the installation yourself. To get an idea whether do-it-yourself installation is something you can tackle, review the basic installation steps. Balance the water in your pool per installation manual specifications. Note: You do not need to drain your pool. Add the required amount of salt to achieve the desired concentration. Note: The installation manual should provide a table detailing the amount of salt needed based on the volume of water in your pool. The salt should be broadcasted across the pool surface. It may take up to 24 hours to fully dissolve. Mount the chlorinator controller on a wall near your pool equipment pad. Wire the chlorinator controller for power according to the manual specifications. Note: Some systems come with a power cord that plugs directly into a ground fault circuit interrupter (GFCI) protected circuit. Others can be wired to an existing time clock, or can be wired directly to the pool pump to get their power. Also, the controller will come with grounding wire and bonding wire for safe electrical connections. Install the chlorinator cell into the pool plumbing after the filter. Note: The chlorinator cell should be the last piece of equipment on the pool pipe before the water returns to the pool. Connect the chlorinator cell to the chlorinator controller. Turn on the pool pump, and check for leaks. Operate the pump for several hours to help circulate water and dissolve the salt. Turn on the salt chlorinator and start enjoying your salt water pool. 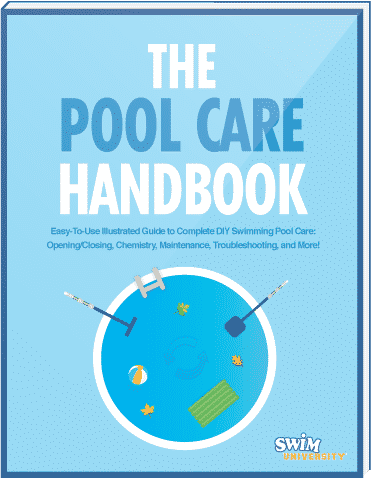 Now that you’ve converted to a salt water pool, what will maintenance be like? Your salt water chlorination system only creates chlorine from salt—it does not balance your water. You’ll still need to test your water regularly, sometimes adding chemicals to balance it. These chemicals are the same ones you’d use in a chlorine pool. But remember, your water will no longer require the large amounts of maintenance chlorine for sanitizing. Skim to remove debris daily, or as frequently as possible. Test for free chlorine and pH weekly. Check and clean your filter, skimmer, and pump weekly. Test alkalinity, calcium hardness, cyanuric acid, metals, and total dissolved solids, and salt levels monthly. Scrub the sides of your pool and vacuum at least once a month. Check your cell for buildup every three months, and clean it with hydrochloric acid as needed. This is one of the most important decisions you’ll make when it comes to maintaining your new salt water pool. Just as you wouldn’t use rock salt at the dinner table, you don’t want to use table salt in your pool. Only pool-grade salt will do. The most important aspect of choosing pool salt If you click this link and make a purchase, we earn a commission at no additional cost to you. is impurity levels—that is, minerals and metals contained in the salt. If you dump salt full of impurities into your pool water, you’ll spend time and money fighting imbalances, metals, or calcium carbonate buildup. The salt’s purity is usually displayed on product packages as a percentage. 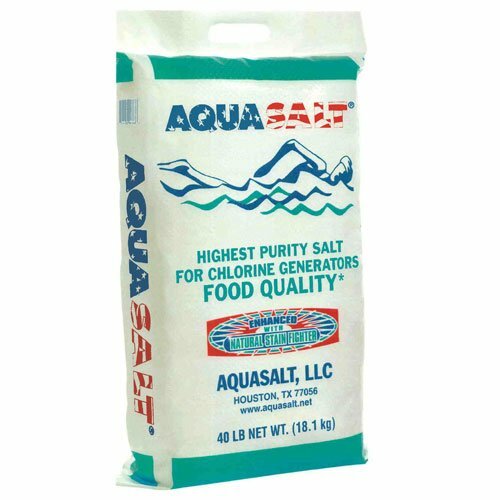 Choose a high-quality pool-grade salt to avoid problems. Also make sure you’re using enough salt for your pool’s volume to maintain a level of 3,200 ppm (parts per million). Converting to a salt water pool may be a simple process, but it’s still a big decision, so you may still have some concerns. We’ll try to put those to rest for you. You may have heard about one potential issue with salt water systems called galvanic corrosion. If you’ve ever lived near the ocean, you’ve seen what happens when salty air and water beat up on metal over time. Is this really a problem with salt water pools? It can be. It doesn’t just occur on metal objects outside your pool, but can also happen when metals are present in your pool water. You can help prevent this is by installing a zinc anode. Is it OK for your pets to drink from a salt water pool? The salinity of your pool water is very low, unlike the ocean. Also, the chlorine levels are no higher than what you’ll find in your own tap water. However, this doesn’t mean you should allow your pet to drink from the pool. If you accidentally swallow some salt water while you’re swimming, it’s not going to hurt you. But drinking from your pool every day would soon begin to have negative effects on your body, particularly your kidneys. The same is true for your pets. If they sneak an occasional drink or two, they’ll be fine. But you must take steps to ensure it doesn’t become a habit, or that they come to think of the pool as a good source of drinking water. 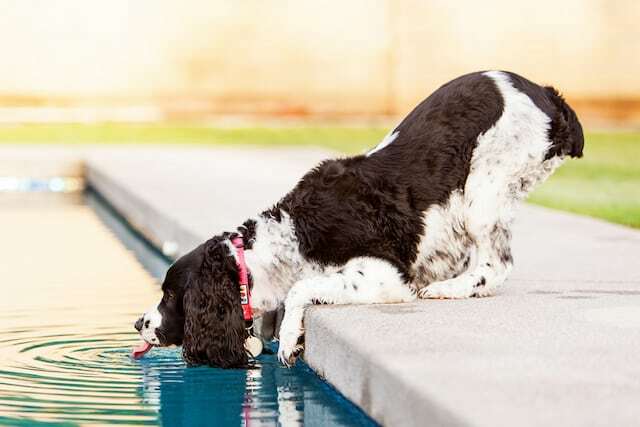 If your pet has any health issues, such as heart disease, kidney disease, or salt restrictions, it’s even more important to ensure they never drink from the pool at all. A common concern is whether the area around your pool will be damaged by converting to salt water. Probably no more than it would be affected by chlorine. Metal pool furniture and fixtures may suffer corrosion over time, so it’s best to avoid those materials, if possible. If salinized water is regularly splashed onto plants around your pool, their health may suffer. Concrete coping and stonework may also be affected if not properly sealed, or at least hosed down after use. While a salt water pool will save you money on chlorine, remember that your pool will still need upkeep to maintain clean, crystal clear water. But if you’re concerned about the pitfalls of chlorine—and you’re tired of green hair—salt water conversion may be the perfect solution for you. Do you have a saltwater pool, or looking to convert? Find out everything you need to know in this be all, end-all guide to salt water chlorinators. You could pour kitchen salt into your pool. Or you can make it easier on yourself. The right kind of pool salt will work better and save you money.